I started running almost 4 years ago. I ran a little bit in middle school but then didn’t run again until I got bored with life in my 20s. A lot of my friends started running. One was training for her first half-marathon. It got me thinking that I, too, could run a half-marathon and so I entered the lottery for the NYC Half. I didn't get in, but was so hooked on the idea of running it, at that point that I ended up raising money for a charity to get a spot in the race! My Garmin. I have an unhealthy addiction to it, although I’m trying to break that! I won’t run without it, but I might run without looking at it now. Also, Oiselle Roga shorts! I have at least 6 pairs of them! Ladies, if you've never tried them, do yourself a favor and get a pair! What is your favorite race/place you have ever done or place to run? 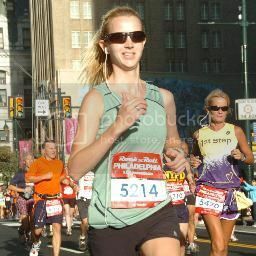 My favorite race was the Philadelphia Marathon. It was my first marathon (last year) and I had a lot of friends and family members there to cheer me on. It was an awesome day and I qualified for the Boston Marathon there! My favorite place to run is Central Park. I do 99% of my runs there and NEVER get sick of it. I love having the option of running on the road or trails when I want to give my legs a little break. Be patient!!! You’re not going to run your goal time after a week or two of running. Build up your mileage and speed slowly to avoid injury. You will get faster and be able to run longer distances, but it takes time!